Like a virtual book club, these posts explore books on performing or learning written by experts but with questions, discussions, and summaries. They are designed to help you decide if a book gives you what you are looking for and a guide to considering. They begin with a summary and progress to a discussion section. If   you are pressed for time and can't read a book, read the summary to get the main points! Or, use the summary to decide if this book is for you. Then continue to discussion questions! This book explores two mindsets about learning or intelligence or ability. The fixed mindset says that intelligence (of any kind) is more or less fixed–that although it may require work to cultivate and perfect, you either have the raw skills or you do not. It believes those skills or abilities are a basic part of you. The growth mindset says that intelligence or ability is a reflection of learning. Growth mindset believes that you can change your intelligence and increase your ability. Always. It seems obvious to say that if you think you can’t improve you won’t. But mindsets go deeper than that, and this book explains how your mindset can affect you unconsciously in surprising, but powerful ways. My favorite anecdote from the book was a rehashing of “The Tortoise and the Hare.” As the author points out the moral of the story is that the tortoise won through hard work. And yet no one wants to be the tortoise. We want to be a hare that is less obnoxious. Most importantly, it gives the fixed mindset message that you only have to work hard if you are not good at something! Effort is weakness. Effort means lack of talent. How can this message possibly work for musicians–or for anyone trying to learn a skill? (spoiler: it cannot). The first thing to know is that one of these mindsets is correct about learning. The growth mindset. Intelligence is not fixed. It simply is not. In fact, the IQ test was made to determine how well school was serving students and which students needed newly designed curriculum. It was not designed to measure a person’s defining ability and it does not. As many researchers will tell you the human brain is an amazingly versatile thing capable of adaptation and learning even into adulthood.Yes, we are a complex result of nature and nurture, but the important part of that is the “and.” Can anyone be Beethoven or Einstein? We don’t know. As in, we can’t know. Dr. Dweck writes, “a person’s true potential is unknown and unknowable.” What we do know is that if you are in the 95% of intelligence, there are heaps of research that points to huge potential in your brain power (and if you are not in that range of intelligence, we simply have less research). Other books go into this more, but I want to make sure that part is clear. Growth mindset is not a trick or a lie or about building confidence with improvement as a side effect. It is rooted in the actual style of learning (more on that below). How does each mindset affect you? In the fixed mindset, your ability is fixed, so you must continually prove to yourself and others that you have it. This is where we get the idea that effort means you lack talent. If you “have it,” you would not need to try, and needing to try means you do not “have it,” whatever “it” means. And if you don’t have “it” now, you never can or will. Fixed mindset means you have to be flawless right away and demands ability before any learning takes place. The actual model of how we learn though is that we take some starting point, isolate something that needs to improve, figure out how to improve it, and implement it. As and After you read! Well, ok you can read it before the book, too. But it might be a little easier when you have more background information. These points discuss how the book relates to the music world, and aim to get you thinking about how it relates to your perspective on this world as well. Where have we seen the effects of mindset in the music world? I was reading this book shouting in my head “this is me!” So many of my struggles emotionally and practically with music stemmed from fixed mindset and I think they are common struggles. Have you ever felt like you needed a teacher to validate you? Not just to tell you you are using the right strategy or that you correctly grasped a concept, but YOU? I have so many memories of waiting for someone to tell me I was good enough to be a clarinetist or to “make it” as a musician. And I know so many friends who have lost their love of music in search of talent. Requiring validation this way puts you in a terrifying state of always trying to prove yourself and to hide weakness and effort. Even when I was being open and honest, there was often still a layer of fear and self-doubt. First of all, that is an awful way to feel and to live your life. It is also the opposite of helpful in terms of improving. As Dr. Dweck points out, the fixed mindset offers no route to improvement when you think you have failed because it does not allow for learning. A good teacher cannot validate you as a person (you as a person already have value) or as a musician (because they cannot predict anything based on your current ability). What they can and should do, is guide you in how to improve and in understanding how your instrument works. Have you ever been jealous of a colleague who didn’t practice yet seemed to be able to show up and play their part? Have you ever heard someone in an ensemble rehearsal proudly exclaim that they didn’t even have to practice their part for this? The message people convey with that is they are so good they didn’t have to practice. Conversely, if you had to practice you are not as good as they are. But practicing is not a sign of weakness or inability. I’ve noticed a strange paradox in (particularly younger) music scenes where we simultaneously value effort and ease. I know I have boasted both “look how much I practiced! I am so dedicated and amazing,” as well as “look how naturally and with how little effort I do this, I must be amazing!” The second one is (even before reading the book) at odds with what we all preach about needing to practice. Upon consideration though, I wonder if the first one also comes from fixed mindset. When I had those thoughts it was about proving that I could work hard enough in this competitive field–showing myself and others I had the dedication we are told music requires. It was not about learning, it was about proving a point. The concept of Talent: what does it mean? In general, this book has made me believe that telling people they are talented is cruel. It is a concept that plagues the arts. If you tell people they are talented it 1) puts a huge amount of pressure on them to succeed 2) shows a huge lack of respect for the amount of work they put in to succeed. If you tell them they aren’t talented, they will think they can never be and that is tragic disservice to them and to the world to which they can no longer contribute their best. I think of all the contributions and discoveries we as a human race could have made if we hadn’t incorrectly taught people that they could not learn. Often though, we tell people they are talented with the best of intentions. In those situations I think we usually mean either a) we think this person created a wonderful project and/or b) recognize and believe in their potential to succeed (even though we all have that potential). Going forward, it seems like those would be more productive, accurate, and kinder compliments to pay someone. And, like Dr. Dweck says, compliment and reward good effort and productive work. Since reading this book I have seen the t-word and it’s various forms being used everywhere. People telling each other or young students that they are talented or smart or good at math or good at drawing or good at dancing, etc (or not good at them). I feel a little queasy each time I hear it now, worried about the mixed message we send each other. What are your thoughts on being talented and what we really mean when we say that? This was one of my favorite parts of the book. There is so much built into this metaphor. It represents to me both how I, as a fixed mindset person felt, and how we teach each other through concepts like this one to see the work from the fixed mindset perspective. First of all, it says that some people are hares and some are tortoises and that simply is not true (metaphorically or literally! hehe). Yes, there are differences in starting abilities and learning styles. But no one is so far ahead or behind that it is like comparing a tortoise to a hare. Next, the metaphor tells us that no matter what the tortoise does, they cannot stop being a tortoise, and they, thus, can never reach the hare. This was always my underlying fear. That I was a tortoise working so hard people thought I might be a hare, and soon I would reach my limit. You have to put forth effort to learn new and more difficult things, and you have to learn new and more difficult things in order to improve. Usually, you won’t get them right the first time, and that doesn’t matter. Trying different methods of succeeding until you find the right one is not failing, it’s learning. And as Dr. Dweck saw, any child with a new puzzle or game will tell you that. In fact, I made an effort to talk to all my students about learning and ability. I was teaching all middle school and younger students at the time I read this, and they were all a little bored and confused by this lesson because it didn’t feel like a lesson. Of course everyone can learn! Sure some people are gifted, but that doesn’t matter. We all go to school to learn. duh? So why do we grown-ups think effort is bad? The tortoise and the hare says it all. Let’s go back to the story of the tortoise and the hare. 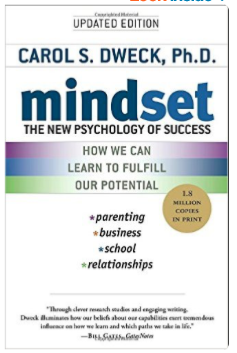 As Dweck explains, fixed mindset people take from this metaphor that a person is either a tortoise or a hare, and if you have to put forth effort, you must be a tortoise. And no matter how hard or long you work, you cannot stop being a tortoise. So you better be a hare if you want to succeed. And if hare is naturally (read effortlessly) fast, you have to succeed without putting forth too much effort. This is a little ridiculous (and a lot dangerous) because effort is crucial to the learning process (obvious, right?) Practicing is just a part of life for anyone trying to improve in any field and it is the only way to do so. Did you find yourself feeling growth mindset for some activities and fixed mindset for others? I know so many academically smart students who did not know they could succeed on their instruments. And I know so many amazing musicians who did not feel confident in their academic classroom skills. Now, certainly you can have different priorities and interests, and certainly time and effort may not seem worthwhile for some students in other subjects. But this book made me wish I could point out to those students that they were wonderful at learning in that area, and, if they wanted they could be that wonderful at learning in another area. The growth mindset seems to give us the gift of choice in our world. The opportunity to decide where we want to succeed as well as the opportunity to know we have that decision. Do you know people who don’t realize they can succeed in other areas? Are you that person yourself? I definitely recognized that I have different mindsets for different activities. I am astounded by my thoughts about my music vs my math ability. I have always succeeded in even upper level math classes, but I never thought I was good at math. It never came easily and I would never have found the solutions I learned if I had had to discover these concepts on my own. But, even if I wasn’t happy about the class, I never doubted that I would have an A. Conversley, I did well in music classes and was told I was good at it, but was always afraid I did not have the talent. Yet my mindset for math was so obviously growth oriented it could have been easy to approach the clarinet with that confidence in my ability to learn. I also have laughable poor spatial skills. Have you ever seen those standardized tests where you have to flip or mirror a shape? I cannot do it. Anything harder than a mirrored rectangle I simply cannot do. I realized though that I have never tried to improve them. I just accepted (mostly because it hasn’t bothered me in any way) that I have terrible spatial skills. But I have terrible spatial skills because I never once tried to make them better. And I have no desire to work on them now because they don’t affect my life. The important thing though, is that I have complete confidence now that if I wanted suddenly to have amazing spatial skills, I could develop them. It’s like a superpower. I suddenly know I can learn anything. And I want you to know that too. I wonder if it not necessarily stress, but stress with this mindset that destroys the well-being of so many people. Think of your busiest time in school with the highest demands and most hectic schedule. That stress is damaging and not fun, but, for me, survivable. Times when I doubted I had the ability? Those were devastating. Those are the situations I don’t want anyone else to ever have to face again. This is not music specific, but there is this concept of effortlessly flawed that seems especially related to women. There’s this concept of the girl who is cool and beautiful without the exhausting and vain effort that usually goes along with it. It tells girls simultaneously that they have to be perfect and that they are not allowed to try or to work towards anything. The girl who is movie-star gorgeous without caring and without trying. That girl doesn’t exist, and as movie stars tell you, anyone can look like that with enough exercise, time, and money–that is, with enough effort. The biggest thing I take from this book (as well as others) is that should we spend less time wondering if we are good enough (because what does that mean anyway? ), and more time wondering how to improve. And also what we want to do as artists. The growth mindset looks at where we are compared to where we want to be, but with the sole, optimistic purpose of helping us get there. That is a much less emotionally daunting and much more practically effective way to approach learning. All of this information is my reflection of conclusions and research by other people. As I read these books I couldn’t wait to share and discuss this information with other people who might benefit from it. These posts are a virtual book club that you can explore at you own pace so that we can consider how to harness this information in a productive way. If you enjoyed reading this book with me or you have any thoughts, let me know! Feel free to suggest books you’d like to see in the Book Club as well!